MARINER 4, 6, 7, 9 – In the late 1960’s, the US sent a total of six spacecraft named Mariner on flyby mission to Mars (two were failures). The first Mariner to make it Mars sent back fax-like images at the blazing speed of 8 bits per second – changing the way earthlings thought of the Red Planet. The 21 images sent back by Mariner 4 pretty all but ended speculation that the 4th rock from the sun was home to a civilization – present or ancient. The canals that 19th century astronomer Percival Lowell brought to public consciousness were not there either. In fact, the place was clearly dry as a bone. But it also seemed pretty clear from images like this that Mars was once warmer and wetter. This notion has formed the basis for much of the science that has followed for the past 40 years. 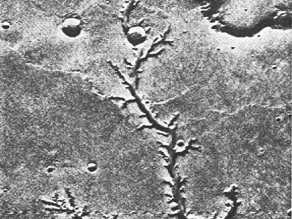 By the time Mariner 9 finished its flyby in 1972, the Mariners had collectively sent back about 7,600 images of Mars. Join Miles this Sunday at 7pm Eastern for an hour-long special on the next Mars landing. The Phoenix Mars lander is scheduled to touch down on the Martian surface during the hour. Miles will be LIVE from mission control at the Jet Propulsion Lab in Pasadena, California. His guest for the hour is Steve Squyres, lead scientist on the Mars Rovers.